Congenital self-healing reticulohistiocytosis (CSHRH) is a benign type of Langerhans cell histiocytosis (LCH) also known as Hashimoto-Pritzker disease. Clinically it presents with skin lesions at birth or in neonatal period, usually without any systemic involvement. Lesions often heal spontaneously in period of weeks to months. We report a case of CSHRH presenting with skin lesions at birth, describing need to make an early diagnosis and to have a multidisciplinary approach with regular follow-up, in managing this rare type of LCH. Langerhans cell histiocytosis (LCH) is a clonal proliferative disease of Langerhans cells with broad spectrum of forms. It can be local asymptomatic form with indolent course or symptomatic form involving multiple organs. They commonly show positive S100/CD1a on immunohistochemistry . The annual incidence rate reported to be 0.5–5.4 million children per year . Congenital self-healing reticulohistiocytosis (CSHRH) is a rare benign variant of LCH first described by Hashimoto and Pritzker . It is generally limited to skin and rapidly self-healing. It presents at birth or in the neonatal period as red-brown papulonodules on the skin, which may be superficially ulcerated. Multiple lesions are most common but the presence of a solitary skin lesion has been reported. Due to its non-specific clinical features and rarity, CSHRH is difficult to diagnose and hence its essential to have an understanding of clinical and histological findings. Herein, we report a case of CSHRH. An 8-month-old female infant born full-term via uncomplicated vaginal delivery with normal birth weight, length and APGAR score, presented with reddish brown papules all over the body, progressively developing since birth. Lesions were predominantly present on trunk, distributed on face, upper and lower limbs (Fig.1). Lesions heal leaving behind depigmented macules. The physical examination was otherwise normal. Clinical differential diagnosis of epidermodysplasia verruciformis and disseminated spitz nevi were considered. The skin biopsy revealed thinned out epidermis overlying aggregates of histiocytes with folded nuclei and pale cytoplasm along with scattered eosinophils (Fig. 2). 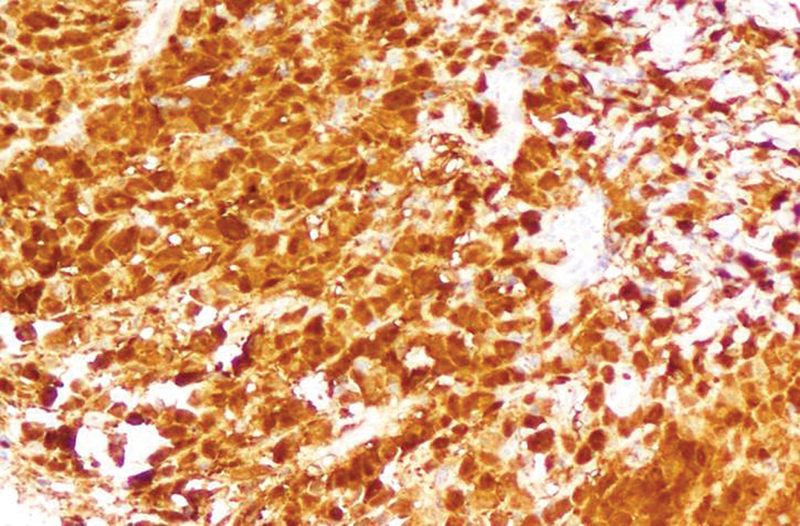 Immunohistochemistry showed CD68 and S100 positivity, suggesting a diagnosis of Langerhans cell histiocytosis (Fig. 3). Laboratory and clinical work up to rule out systemic involvement including complete blood count, coagulation profile, urine analysis, X-Rays of skull, chest and long bones and abdominal ultrasound were normal. During next few months, the skin lesions resolved considerably with only residual hypopigmentation. No new skin lesions or any systemic involvement were noted. Child is kept under monthly follow-up on out-patient basis. Figure 1. Reddish brown papules over the back leaving behind depigmented macules on healing. Langerhans cell histiocytosis is a heterogeneous disease, involving the accumulation of Langerhans cells in various organs. 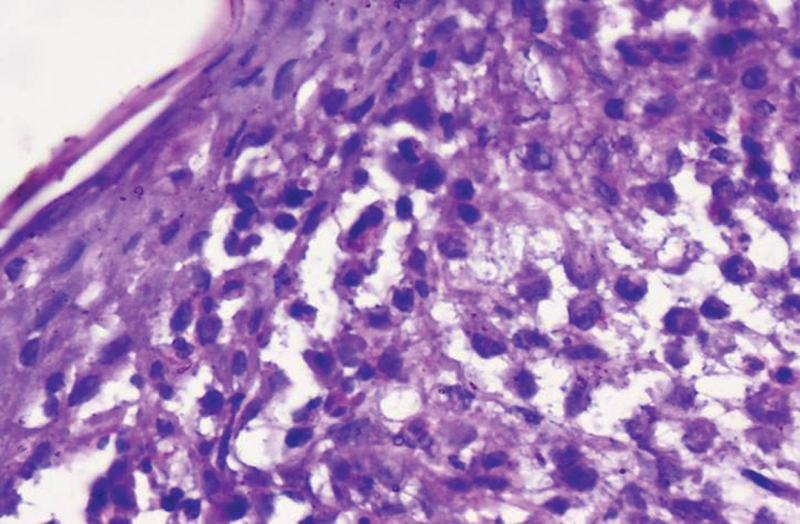 A diagnosis of LCH is typically made with a skin biopsy that shows positive immunohistochemical staining of infiltrative cells in the dermis with CD1a and S-100. These cells also exhibit classic Birbeck granules on electron microscopy, which was once the gold standard for identifying Langerhans cells before immunohistochemistry became more prominent . Congenital self-healing reticulohistiocytosis is a single-system LCH with a benign prognosis. The condition is rare, and the incidence reported in the literature varies substantially, possibly because the disease has the potential to resolve while undiagnosed. 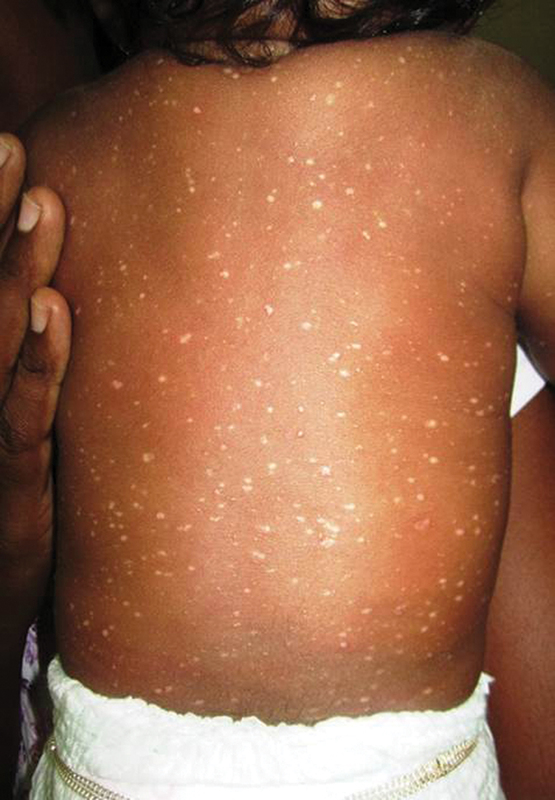 The disease is characterized by presence of cutaneous lesions such as papules, nodules and vesicles, usually at birth or in the neonatal period, without systemic involvement. Spontaneous involution and absence of systemic symptoms are marked characteristics for differentiation with the other clinical spectra of Langerhans cell histiocytosis . However, there are rare reports of pulmonary and ocular involvement in CSHRH that resolved along with cutaneous findings [6,7]. There have also been reports of disseminated brown or violaceous non-blanching macules and papules raising concerns of congenital infections or other hematological disorders as seen with the “blueberry muffin” lesions . Patients with CSHRH have excellent survival rate and no report of death have been found in the literature. There are no specific recommended treatments for CSHRH, but if lesions persist, topical corticosteroids, tacrolimus, or nitrogen mustard can be used, or localized lesions may be excised . It is important to follow the patient for long periods to detect possible systemic involvement, since there are reports of recurrence involving skin, mucosa, bones and pituitary gland .As this is a rare disease with variable presentation, it is important for us to diagnose it early and have a multidisciplinary long term follow-up. This will prevent administration of systemic toxic therapy to infant and also help in identifying recurrences, if any. 1. Satter E, High W. Langerhans cell histiocytosis: a review of the current recommendations of the Histiocyte Society. Pediatr Dermatol. 2008;25:291-5. 2. Alston RD, Tatevossian RG, McNally RJ, Kelsey A, Birch JM, Eden TO. Incidence and survival of childhood LCH in northwest England from 1954 to 1998. Pediatr Blood Cancer. 2007;48:555–60. 3. Hashimoto K, Pritzker MS. Electron microscopic study of reticulohistiocytoma: an unusual case of congenital, self-healing reticulohistiocytosis. Arch Dermatol. 1973;107:263–70. 4. Berger TG, Lane AT, Headington JT, Hartmann K, Burrish G, Levin MW, et al. A solitary variant of congenital self-healing reticulohistiocytosis: solitary Hashimoto-Pritzker disease. Pediatr Dermatol. 1986;3:230–6. 5. Kapur P, Erickson C, Rakheja D, Carder KR, Hoang MP. Congenital self-healing reticulohistiocytosis (Hashimoto-Pritzker disease): ten-year experience at Dallas Children’s Medical Center. J Am Acad Dermatol. 2007; 56:290-4. 6. Chunharas A, Pabunruang W, Hongeng S. Congenital self-healing Langerhans cell histiocytosis with pulmonary involvement: spontaneous regression. J Med Assoc Thai. 2002;85(Suppl 4):S1309–S1313. 7. Zaenglein AL, Steele MA, Kamino H, Chang MW. Congenital self-healing reticulohistiocytosis with eye involvement. Pediatr Dermatol. 2001;18:135–137. 8. Popadic S, Brasanac D, Arsov B, Nikolic M. Congenital self-healing histiocytosis presenting as blueberry muffin baby: a case report and literature review. Indian J Dermatol Venereol Leprol. 2012;78:407. 9. Hoeger PH, Nanduri VR, Harper JI, Atherton DA, Pritchard J. Long term follow up of topical mustine treatment for cutaneous langerhans cell histiocytosis. Arch Dis Child. 2000;82:483–487. 10. Longaker MA, Frieden IJ, Leboit, PE, Sherertz EF. Congenital “self-healing” Langerhans cell histiocytosis: the need for long-term follow-up. J Am Acad Dermatol. 1994;31:910-6.